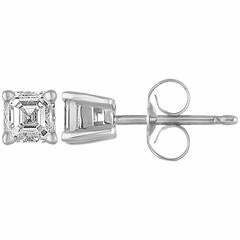 Classic diamond stud earrings set in 18K white gold 3-prong mountings with sturdy tension set backs. Each mounting holds a 0.235 round diamond, for a total carat weight of 0.47. The quality of the stones is approximately H/VS-SI. Hearts On Fire diamonds are the world's most perfectly cut diamonds, allowing for maximum light return and brilliance. These earrings will be shipped with an official Hearts On Fire Certificate of Authenticity.